Looking For Shakespeare Quotes? Read On! This Shakespeare quotes page links to all sorts of Shakespeare quotes, along with their modern translations. Shakespeare is the most quoted English writer of all time, with his plays and sonnets enduring popularity around the world. It’s not surprising given the volume and quality of works that Shakespeare wrote that virtually everyone can quote at least a few words of Shakespeare – even if at times they don’t know they’re doing it! Want to impress a loved one? 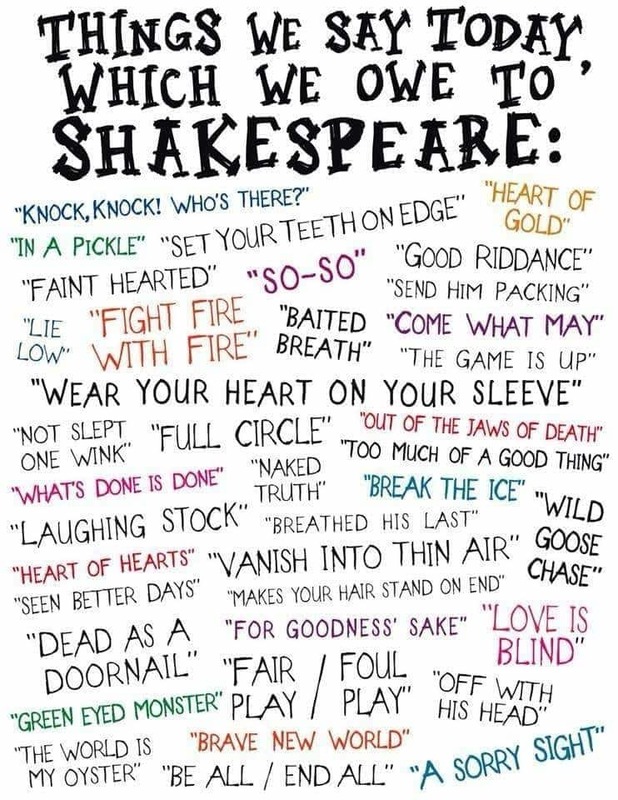 Have a look at the 50 top Shakespeare love quotes, along with their translations into modern English. Feeling down? Read our top 50 Shakespeare quotes about death. Spaced out? Browse Shakespeare’s quotes about dreams. Feeling peckish? Read Shakespeare’s top 20 quotes about food & drink. Feeling lonesome? Read Shakespeare’s goodbye quotes. And how about having a read through the top 20 quotes about Shakespeare from writers over the years. Whilst reading quotes is a great way to take in the language in your own time, hearing Shakespeare’s word performed can really bring them to life. Listen to these students performing 37 well known Shakespeare quotes in 2 minutes. Is anyone familiar with the line ; ‘If you want to do a great good; do a little evil’ I believe it is attributed to Shakespeare. Please complete, give context, speaker, and play name source. What play is this quote from ? and what is its’ meaning ? “I risk my life for my own work and my reason has half foundered in it”? Trying to discover Shakespeare quote the ends with “Therefore am not a beast”. It denotes that man can be more cruel than an animal! You may be referring to a line from Rosalind in As you like it, act IV scene II, somewhere around line 72, when she’s reading from a letter to her sent by Pheobe. It’s a similar line but not exact. I’m uncertain of this, but there may be another line, also by Rosalind later that is closer to what you said above, and if there is, it’s around the scene where she is striking a bargain with phoebe about not marrying a woman. I’ve not checked these details and I’m going by memory so sorry if I’m not anywhere near what your looking for. I just remember that line from the reading of the letter. Hope it helps. Richard the Third Act 1, scene 2 , spoken by Richard in reply to Lady Anne (whose husband and father-in-law he has slain) and who he is trying to seduce. This follows her line to the effect that even beasts are capable of a modicum of pity. He replies: “But I know none, therefore am no beast”. ‘No Beast so fierce that knows some touch of mercy’. otra a lo largo de sesiones tan largas se hace imposible en Boom Beach en una nueva forma. para comenzar de buena forma en éste gran juego.